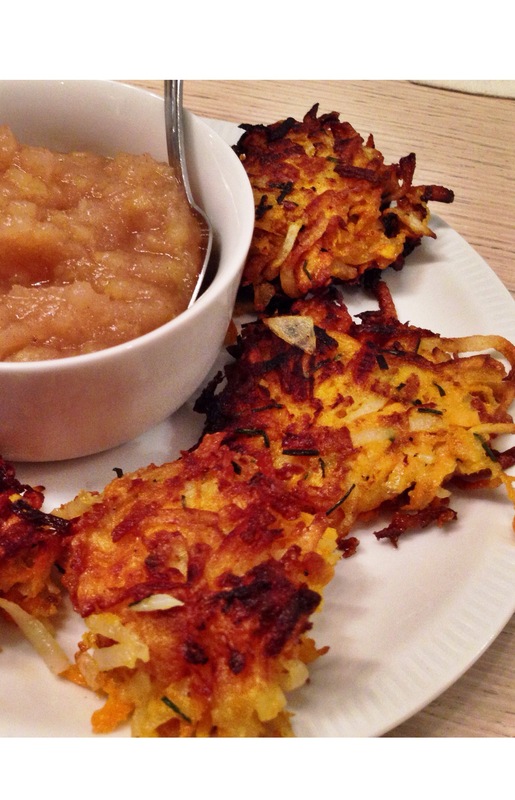 Thanksgivukkah (Thanksgiving + Hannukah) was a once-in-a-lifetime celebration so I thought, what better time to try a modified version of our typical potato latke recipe?! While this collision of two holidays won’t happen for another 70,000 years, I foresee a lot more sweet potato latkes in my family’s near future because they were that good. If you can’t tell, I’m a big advocate for sweet potatoes and they’ve become a staple at dinner tables around the country this holiday season. Sweet potatoes are high in vitamin B6, vitamin C, and vitamin D (…and so much more). This sweet tasting root vegetable has major functions: It aids in the prevention of degenerative diseases as well as helping our immune system and stress levels to stay intact, which is especially necessary during the peak of holiday pressures and moodiness. Ditch the sour cream and top your latkes off with a dollop of unsweetened applesauce for added vitamin C and natural sweetness! My mom went all out and treated us to her homemade apple sauce, which is always a better option than store-bought… but I’ll save that for another post. 1. In a large bowl, combine scallions and eggs. 2. Add flour, salt, ginger, cardamom, and pepper, stir until fully combined. 3. Add potatoes into the mix and toss.